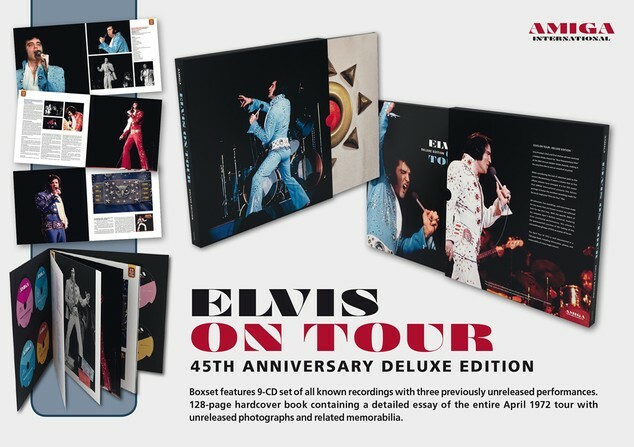 Amiga International has released, Elvis On Tour: 45th Anniversary Edition CD boxset, a long awaited LIMITED-EDITION boxset featuring 9-CD's, all remastered, of all known recordings made for the Golden Globe Award-winning concert documentary ELVIS ON TOUR. This will include the premiere of the complete rehearsal recorded in Buffalo, NY on April 5, 1972, with three previously unreleased performances. When considering the lack of attention paid to this concert documentary, it seems a shame that so few official releases have emerged. 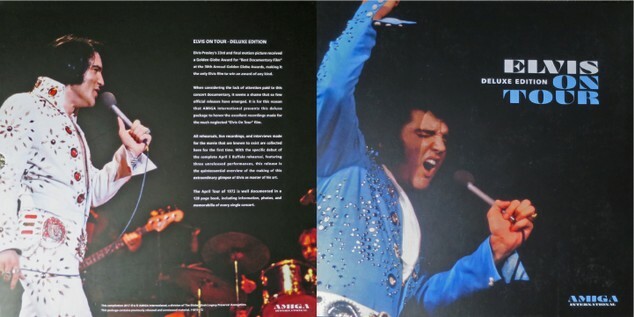 It is for this reason that AMIGA International presents this deluxe package to honor the excellent recordings made for the much neglected 'Elvis On Tour' film. The audio / visual experience is undeniably the quintessential overview of the making and scrutiny of this extraordinary glimpse of Elvis as master of his art. Here we have a sound sample of the three (3) unreleased tracks from the Buffalo rehearsal. This shows you the quality of the audio recording and a first listen to these previously unreleased performances. The sound is not perfect, but they do sound pretty good! They are not 'bad', as some have speculated. (NOTE: low res mp3 files). Elvis News Latest Audio (and video) updates : Video courtesy of Elvis Presley MP3 Audio Elvis Presley MP3 Audio Central. This comparison is from the new 'Amiga' 'On Tour' Deluxe release and the previously released 'Madison' 'Red Hot in Richmond' release. The 'Madison' does not compare well with the new Amiga On Tour Deluxe release - even with this very low-res mp3 sound-sample, the difference is obvious.